I am pleased to announce the Kindle ebook edition of Souls in Silicon, my second short fiction collection, containing all my stories about strong AI, plus excerpts from both The Cunning Blood and Ten Gentle Opportunities. It’s available for $2.99, or as part of your Kindle Unlimited subscription. No DRM. The POD paperback edition has been available since 2008. I’ve updated the cover to a more legible font; the same font used in The Cunning Blood and Cold Hands and Other Stories. I’m evolving a line look here, and so far, I like it a lot. The original cover type font for Souls in Silicon was a little more atmospheric, but it didn’t read well on Amazon thumbnails. 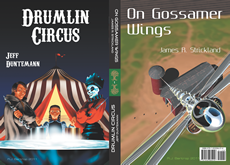 The cover art is the same 2008 drawing by Richard Bartrop, created specifically for the book. People who have followed my work closely since the beginning (there are a few) will notice that “Ariel” from Burchenal Green’s Tales of the Marvelous Machine isn’t here. It wasn’t in the POD paperback either. The reasons are complicated. “Ariel” centered on two characters from a failed novel that I was tinkering in 1980 and eventually abandoned as untenable. The theology, furthermore, is dicey. I know more now than I did then. A modern priest who grew up with computer technology would not have the reaction that Fr. Fiocca did to Ariel the AI. So I’ve wondered here and there down the years if I should rewrite the story. If I did it would be a pretty radical rewrite. That decision will have to wait for another day; there’s too much to do in the meantime. I have one more significant story, a longish novella, that needs to be dealt with and posted on Kindle, but it has its own share of problems, which I’ll talk about in a future Contra entry. In the meantime, Souls in Silicon is up there. Go get it. Don’t forget to drop a review on Amazon when you can. Right now, I have stuff to write. Lots of stuff. Ten Gentle Opportunities: Go Get It! In case you hadn’t gotten the word yet, this morning Amazon cleared my upload of Ten Gentle Opportunities, and it’s now in the catalog, ready to buy for $2.99, or as part of your Kindle Unlimited subscription. No DRM. Cover by the utterly amazing Blake Henriksen. It’s in a genre that barely exists anymore: Humorous SF and fantasy, with a pinch of satire for those with ears to listen. I tried to shop it to tradpub imprints for a couple of years after I finished it in 2012. An editor at a major press told me that Douglas Adams did SF humor so well that nobody else can ever hope to compete. Huh? That’s like saying that Heinlein did hard SF so well that nobody else should bother to try. Well, dammit, I’m competing. More than one of my beta readers said the book kept them up all night, and one called it “pee-your-pants funny.” Me, I consider that a win. The book has an interesting history. I’ve been fooling with it for almost fifty years. Not much happened on the story. I had a short catalog of gimmicks and little else. The Spellbender had a sidekick who was an incompetent djinn named Shrovo. Not only could he not remember how many wishes he gave people, he simply couldn’t count, and so had had his djinn license revoked for reckless and excessive wishgranting. Sure, it sounds dumb. I was 15. I eventually got bored with it and tossed it back in the trunk, where it stayed until 1978. That year I read it over, dumped Shrovo, and told another tale about the Spellbender, which I presented at the Windy City Writers’ Workshop, in front of luminaries like George R. R. Martin and Gene Wolfe. Nobody liked it. Back in the trunk it went. Come 1983, I had become a close friend of Nancy Kress, and we surprised one another by collaborating on a novelette that was published in Omni and drew a surprising amount of favorable buzz. If we could pull off “Borovsky’s Hollow Woman,” well, what else could we do? Nan suggested a contemporary fantasy, and I was quick to sketch out still another take on the spellbender concept, adding in the sort of universe-jumping gimmick that Sprague de Camp and Fletcher Pratt had used to such good effect in the Harold Shea stories. A spellbender who had gotten on the wrong side of a magician jumps universes to finds a place to hide, and lands in a small-town advertising agency in our near future. Nan was working for precisely such an agency at the time, and told the story of a staff meeting at which someone was talking emphatically about tangential opportunities, which Nan heard as “ten gentle opportunities.” I knew a great title when I saw one, and grabbed it. I also drew on a novelette I wrote in 1981, which centered on a war in a robotic copier factory, and an AI named Simple Simon. We tried. We really did. But as it turned out, Nan could move in a hard SF world a great deal more nimbly than I was able to move in a fantasy world. Shades of Lee Anne down the street. (Puberty, at least, was no longer an issue.) After a few thousand words she ceded me what we had and we decided to set it aside. Back in the trunk it went, this time for almost 25 years. Basically, I went with fun. And it was. I wrote three or four chapters in 2006, then got distracted by another concept that I’ve mentioned here, Old Catholics. TGO didn’t exactly go back in the trunk, but I didn’t touch it again until February 2011. That’s when I took it to this new writer’s group I’d joined. I submitted the first thousand words or so for critique and asked them if the concept was worth pursuing. The answer was yes, and it was unanimous. I took it to Walter Jon Williams’ Taos Toolbox workshop that summer, and got my momentum back. After that it was my main writing project until I finished it in November 2012. I asked my nonfiction agent to shop it, and some shopping got done, but there were no nibbles. So several months ago I took it back and decided to publish it myself. Oh–and then we kicked into high gear with our move to Phoenix. Writing of all sorts went on the back burner. Which brings us to the current day. There’s a lot to be done yet here in the new house, but the end is at least in sight. We’re far enough along that I can afford to take a couple of days a week to Just Write. Which brings me (again) to the question of what I do now. Truth is, I don’t know. But I’ll think of something. Well, I’m back. Back from being incommunicado, mostly, and (almost) back from being nose-deep in boxes in dire need of emptying. I’m now not quite calf-deep in boxes, having emptied sixteen today alone, twelve of them boxes of books. Carol polished the last two Hundavad bookshelves yesterday, and today I filled them. I think there are maybe three more boxes of books, possibly four. Overall, I think fewer than 25 boxes remain to be emptied. Our biggest single problem for our first two weeks here was getting access to the Internet. Yes, we probably got more done per unit time without Facebook to mess with, but I don’t like being completely disconnected. Cox Cable had to run brand new coax from the node in the alley to the house. My guess is that the existing coax was damaged when the house was gutted to the walls in 2003 and rebuilt. (Bulldozers and Bobcat front-loaders can do that.) It took two weeks, during which we were eating out a lot at places with free Wi-Fi, especially Wildflower Bread Company but occasionally Einstein’s Bagels. The previous owner had Dish, and evidently never used cable. He had coax outlets in every room in the house, including the master bathroom. All of it came together behind a panel in one of the walk-in closets. (Above.) Some cables are marked, many aren’t, and I have no clue what the unmarked cables are about. So, mostly, I’m ignoring them. We have little interest in TV to begin with, and I’m going to explore streaming from the Internet to our big wi-fi enabled Samsung TV. When the Cable Guy came yesterday morning to hook up the new coax, he found which cable from the ratsnest above went out to the box outside the house, dropped in a cable modem, and handed me a Cat 5E patch cord. I had literally hung an old Wireless G router on a nail next to the panel, and connected the four switch ports to the four Cat 5 sockets in the panel. (It’ll do until I get an 802.11ac router and build a more elegant mount for it.) I plugged in the patch cord, and It Just Worked. Yeah, I know, it sounds lame, but it didn’t really feel like home here without broadband. Now it does. We don’t even have a kitchen table (we’re shopping) and have been eating all our at-home meals at the island breakfast bar, but it still feels like home. Bit by bit, other things are falling into place as well: I drilled and tapped two holes in a Linksys 5-port switch and made an aluminum bracket for it to hold it to my temporary computer table, and that helped. (Making my drill press turn over for the first time in who knows how many weeks felt peculiarly good.) But bottom line, it was broadband that did the trick. Happy new year, everybody. There’s much to write, and I can (finally) see some quality writing time heaving up over the horizon. In the meantime, expect more Contra. Alas, expect some delay in my getting Ten Gentle Opportunities posted on Kindle. Life happens, and always takes longer than you expect. It does, however, happen. More later.